There are so many diamond shapes to choose from when shopping for an engagement ring: round, square, marquise and more. Here’s a guide to what makes each shape special to help you pick the perfect one. First, it’s important to know the difference between a diamond’s shape and its cut. Shape describes a diamond’s basic outline when viewed face up (round, square, oval, etc.). Cut, or cutting style, refers to how the diamond’s facets are arranged. For example, the most common cutting style for diamond shapes is the brilliant cut with an arrangement of 57 or 58 facets designed to maximize sparkle. Some diamonds, most commonly square or rectangular shapes, are step cut. Emerald cut and Asscher cut diamonds are examples. The step cut has concentric rows of facets on the crown and pavilion for a more elegant look. However, not all square or rectangular diamonds are step cut; many are brilliant cut, like the radiant and princess cut diamond. Round is the most popular of the diamond shapes for an engagement ring, and it holds this title because the round brilliant cut is designed to produce maximum brightness, fire and sparkle in a colorless diamond. The modern round brilliant cut diamond has a round girdle outline, 56 symmetrically placed triangular and kite-shaped facets, a table facet and an optional culet facet, for a total of 57 or 58 facets. Lapidaries have been cutting round diamonds for centuries, but it wasn’t until the invention of the bruting machine in the early 1870s that a round diamond could be more easily made with a pleasing, symmetrical outline. The first of these was the old European cut diamond, a precursor to the modern round brilliant cut but with a higher crown and greater total depth than its modern counterpart. 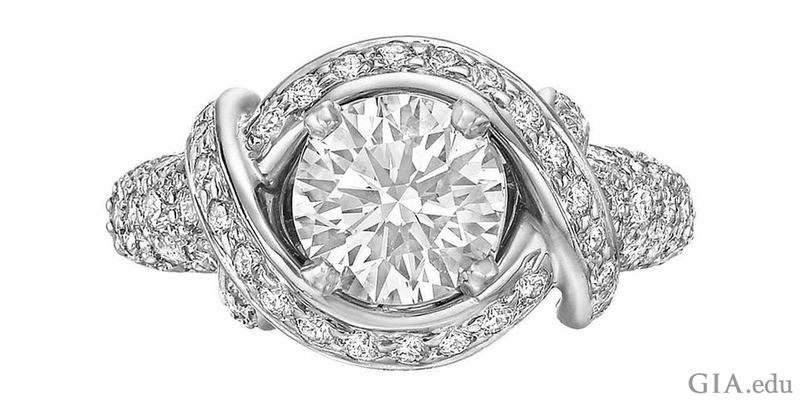 The old European cut is still a popular choice for brides wanting an antique look. 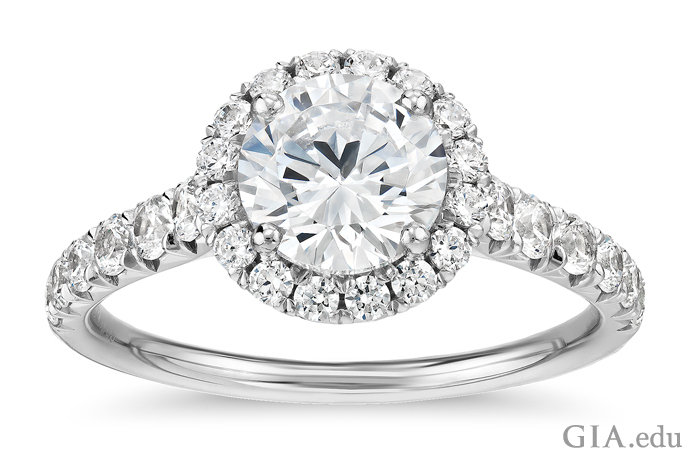 Symmetry is key when shopping for a round diamond. And if the diamond is cut as a round brilliant, as most are, pay attention to its cut quality, or how well it interacts with light. Look for brightness (often called brilliance) – the internal and external reflections of white light. 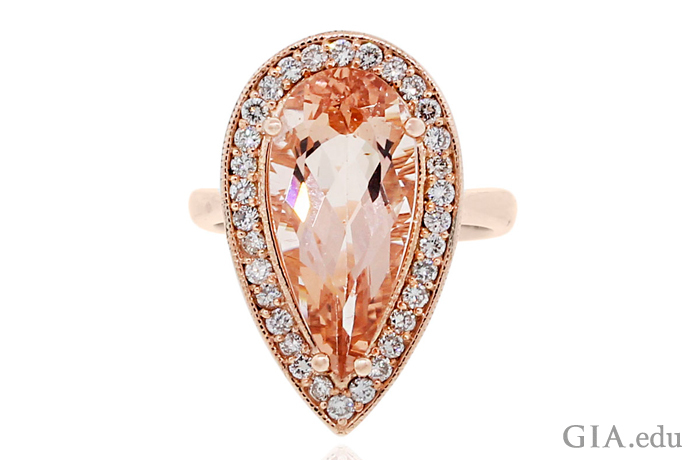 Fire – the flashes of color seen as you rock the diamond under the store’s spotlights. 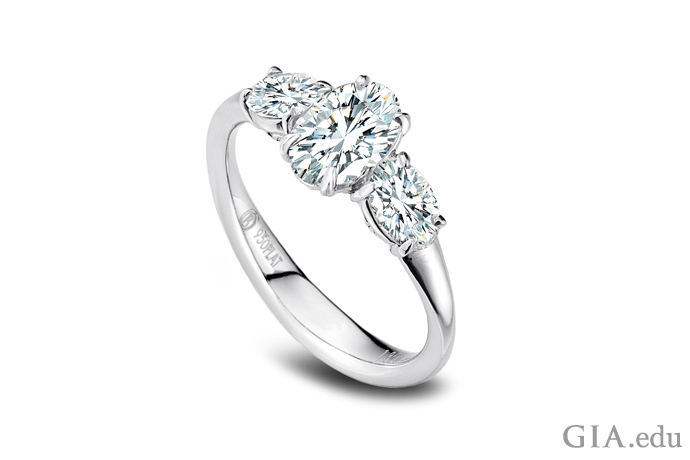 Sparkle – spots of light that flash when the diamond moves. And scintillation – a combination of sparkle and balanced patterns of bright and dark areas. Well-cut round diamonds are brighter with more fire and scintillation than poorly cut ones, even if they’re of equivalent color, clarity and carat weight. Avoid diamonds with extremely thin or “knife-edge” girdles or with inclusions near the girdle, which make them more vulnerable to damage. To be certain of the quality of the cut on your round brilliant diamond, buy one with a GIA diamond grading report, which will provide an objective assessment. Look for a cut grade of Excellent or Very Good. Rectangular diamond shapes have a long history and a reputation for classic elegance in an engagement ring. The elongated shape can make a bride’s fingers look longer and more slender. Three of the most common rectangular diamond shapes are actually modified rectangles: the emerald cut, cushion cut and radiant cut. 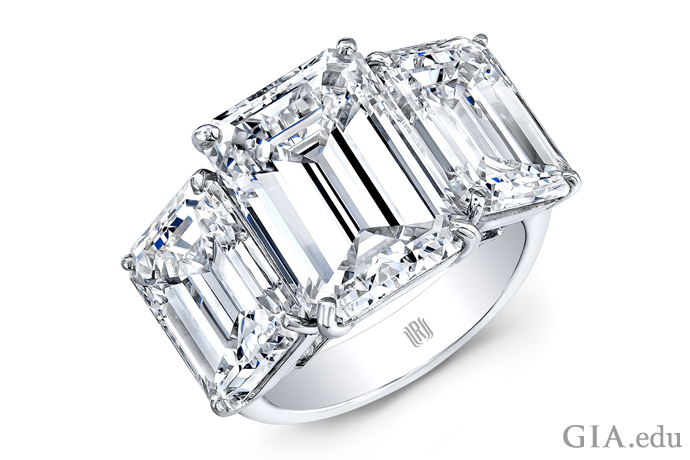 Emerald cut: With its crisp, sophisticated lines, the emerald cut is the most popular of the step-cut diamonds. Its four longer sides have beveled corners with two, three or four concentric rows of facets, parallel to the girdle, on the crown and pavilion. 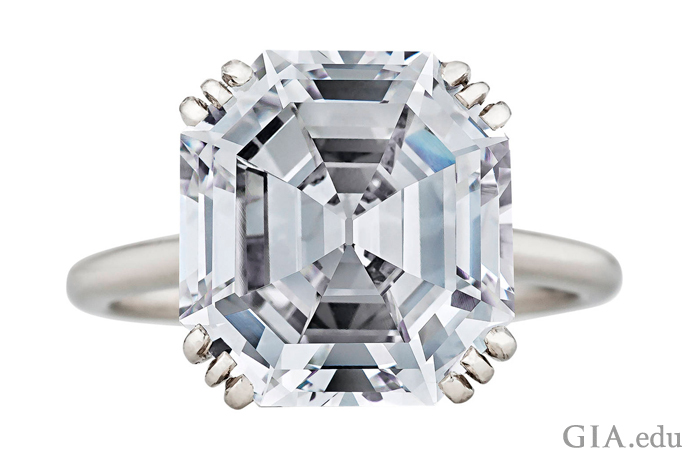 An emerald cut diamond engagement ring is a perennial favorite with the stylish elite. 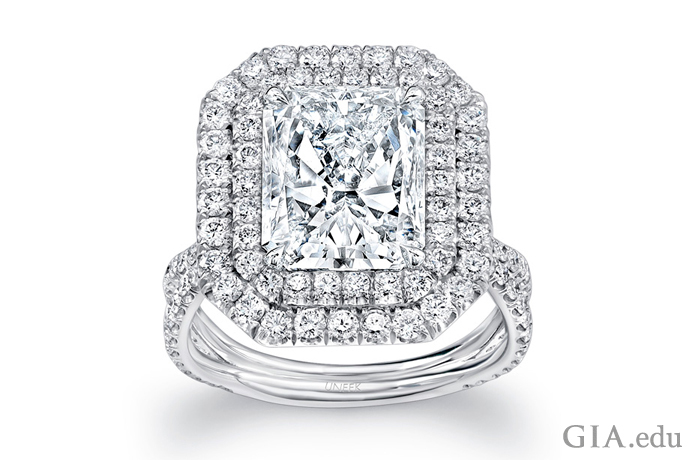 Cushion cut: Adorning the fingers of brides for centuries, the cushion cut diamond has curved sides and rounded corners. It typically has a high crown, small table, deep pavilion and large culet facet. 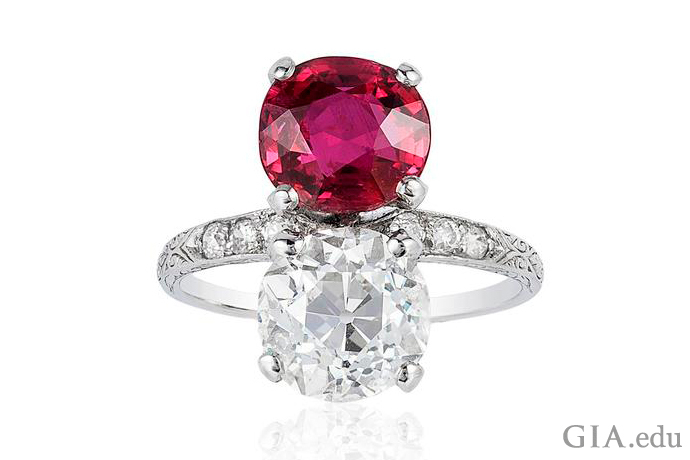 Since the cushion cut retains more color face up than a brilliant cut, a cushion cut is well suited to colored diamonds. 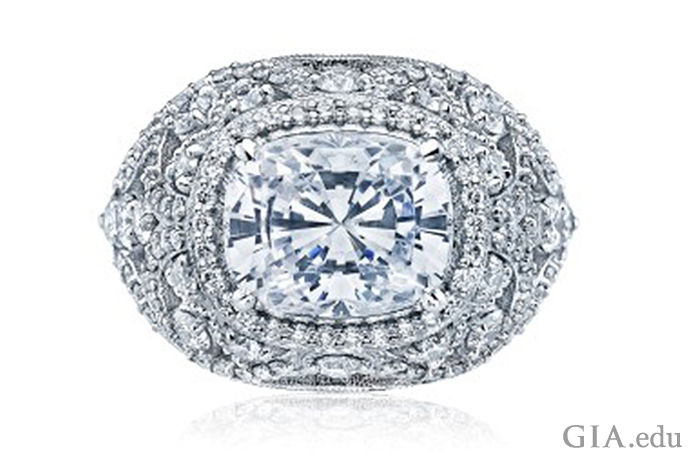 A cushion cut diamond will be a hit with a bride who favors an antique style for her engagement ring. Radiant cut: One of the newest rectangular shaped diamonds is the radiant cut, a modified brilliant cut introduced in 1977. 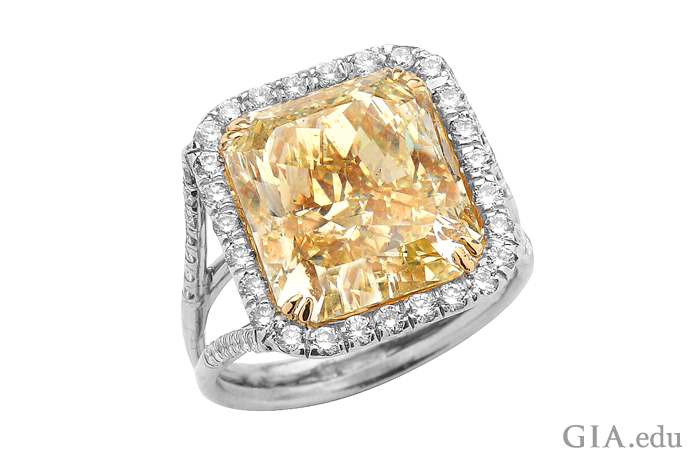 It boasts the fire of a round brilliant cut diamond in a rectangular or square shape with cropped corners. As with all diamond shapes, symmetry is important for rectangular diamonds. Facets on opposite sides should be parallel to one another, corners should be cropped to identical size and the culet should be well centered. For radiant cut diamonds, look for brightness, sparkle and scintillation, as you would for a round brilliant cut diamond. Clarity is less of a concern, as the modified brilliant cut faceting pattern can disguise inclusions that would be more visible in an emerald cut diamond. Square diamond shapes are perfect for the woman with long, slender fingers who wants them to look shorter. They are also a statement of individuality for a bride who would appreciate a contemporary alternative to the classic round brilliant cut. Want a square shaped diamond in your engagement ring? 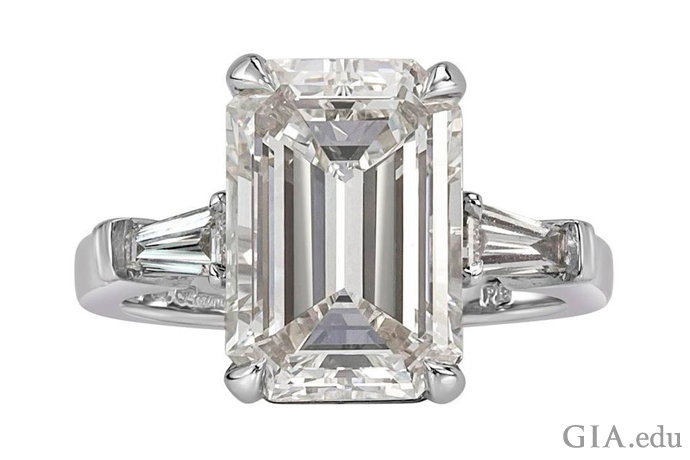 In addition to the square versions of the cushion cut, emerald cut and radiant cut diamonds described above, consider the princess cut or Asscher cut. Created in 1981, the princess cut diamond has a modified brilliant facet arrangement that gives it electrifying sparkle and scintillation. For a very different, but surprisingly modern look, the Asscher cut – first introduced in 1902 but since modified for greater brilliance – is similar to a square emerald cut but with larger step facets, a higher crown and a smaller table. Unlike the pointed corners of the princess cut, the corners of an Asscher cut are cropped, giving it the appearance of an octagon. Again, look for good symmetry. Facets should match on either side of an imaginary line drawn down the middle of the stone. Look for a balanced contrast of light and dark patterns in the table and other facets. Fine princess and Asscher cut diamonds will not have a culet facet, which must be taken into consideration when mounting the stone. 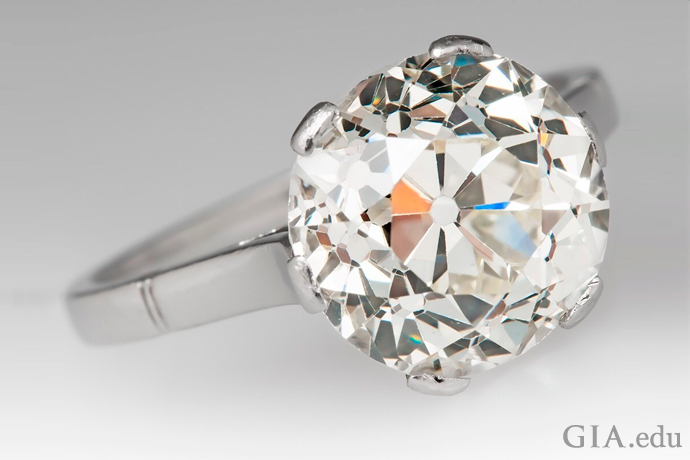 The culet is a safety facet that helps protect the point on the pavilion from chipping when the diamond is loose or if it is exposed in a setting. 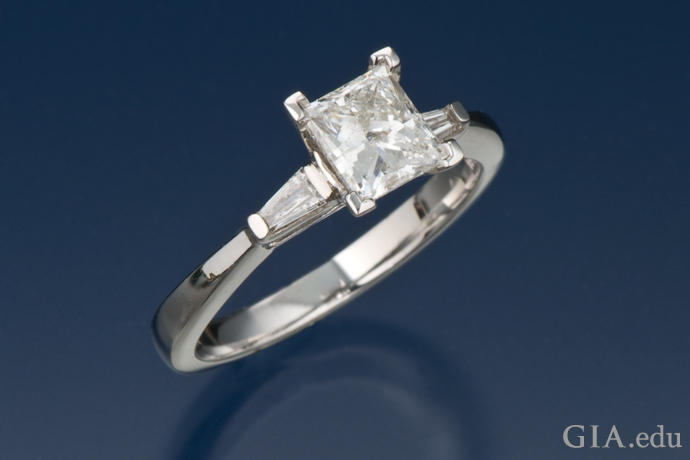 In addition, for the princess cut, it is important to choose a prong or bezel setting that protects the pointed corners. As with emerald cut diamonds, the Asscher cut is most effective for diamonds that are colorless (D–F on the GIA color scale) or colored diamonds. An attractive, elongated shape with a royal pedigree, the marquise (pronounced “mahr-keez”) was supposedly named for the Marquise de Pompadour, a mistress of King Louis XV, as its outline resembled the shape of her mouth. 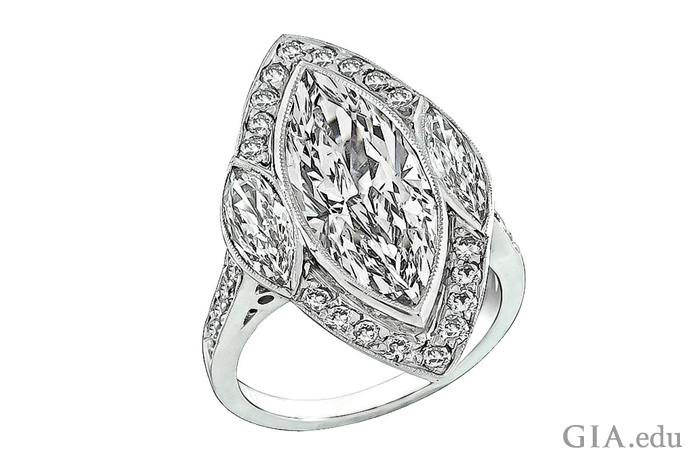 Because of its shape, a marquise diamond ring will look larger face up than a round diamond of the same weight. 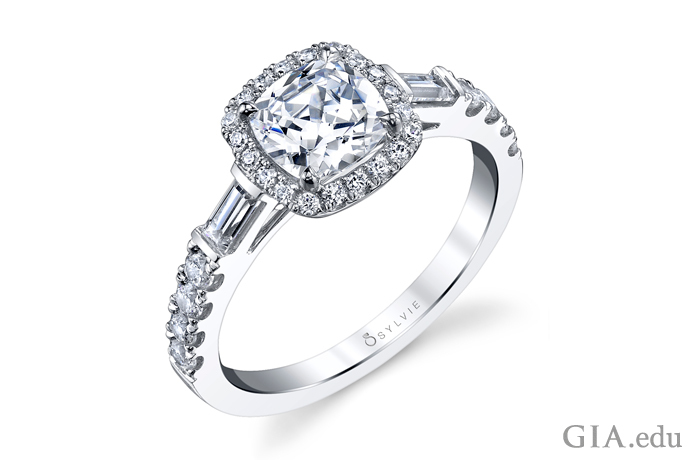 A marquise diamond engagement ring can also make the finger appear longer and more slender. 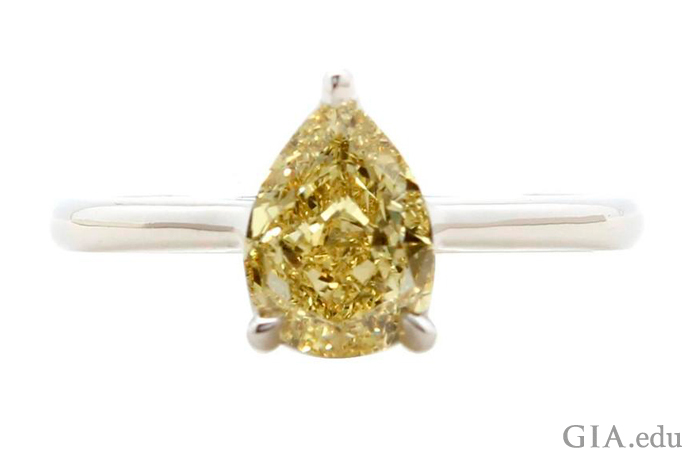 Several factors must be considered when choosing a marquise diamond. You want a marquise that is neither too long (and thus may sacrifice brightness and pattern) or too short (“stubby”) and thus loses the benefit of length to your bride’s finger. The points at either end should be sharp. 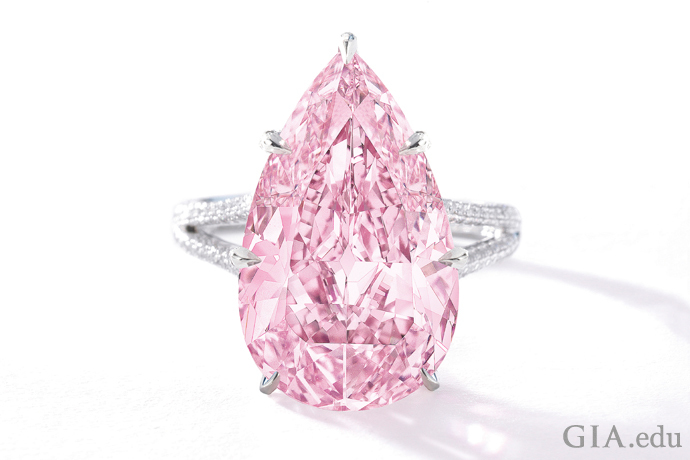 Symmetry is extremely important for marquise diamonds. Both sides (wings) should have the same amount of curve, and the facets on one side of that imaginary line down the center of the diamond should match exactly the shape and size of the facets on the other side. Since the tips of a marquise diamond are where it is most vulnerable, it is not unusual for them to have slightly greater girdle thickness. If the marquise diamond is prong set, choose V-shaped prongs for the tips. A well-cut marquise will typically display a minimal to no bow-tie pattern. Learn how to spot the bow tie effect in diamonds. 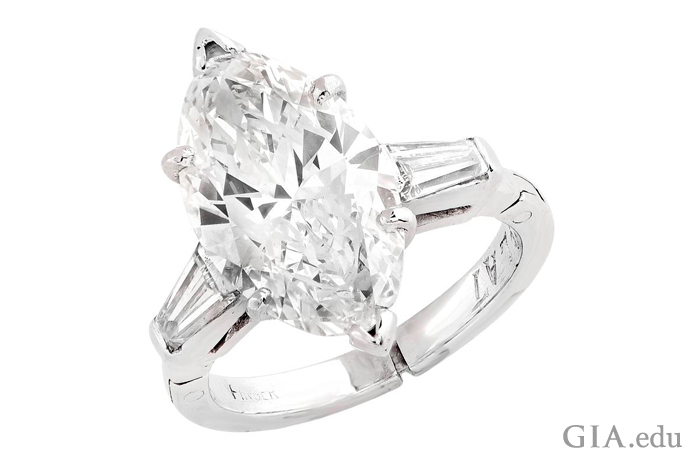 Although a shape that is many hundreds of years old, the oval diamond has gained popularity in recent years because of its elegance and the fire it shows when cut in the brilliant faceting style. In addition, with its greater surface area, an oval diamond may appear larger than a round brilliant diamond of the same weight (and, like rectangular and marquise diamonds, can help elongate shorter fingers). One advantage over other fancy shapes is that the rounded edges make it less prone to chipping. Pay attention to proportion. 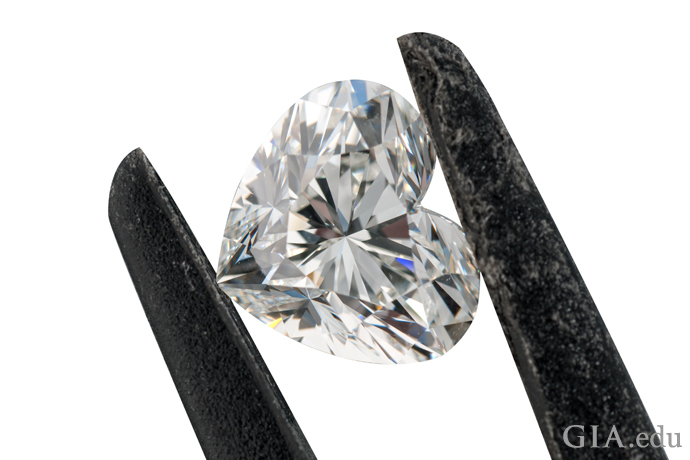 Longer oval diamonds are preferred by some, but they are not practical to cut so tend to be harder to find. 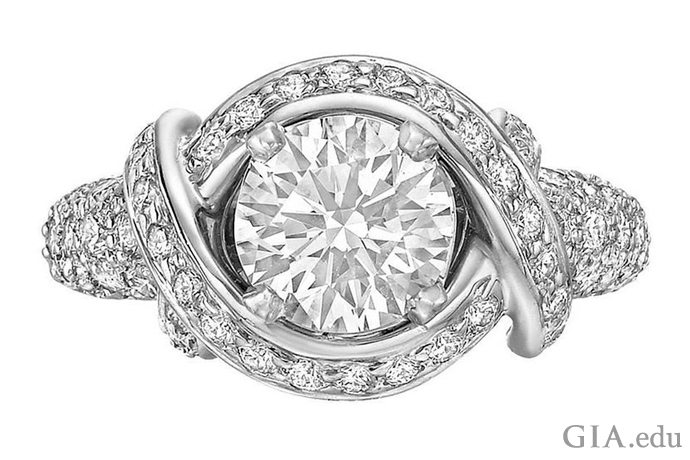 As with other fancy diamond shapes, symmetry is essential to ensuring beauty in an oval diamond. Again, placing an imaginary line down the length of the diamond and then across its center, the shape and faceting of the two halves should be identical. Also look for a graceful outline and the size and nature of the bow-tie pattern. The bow tie on a well-cut oval diamond will be minimal or non-existent. An irresistible blend of the marquise and round brilliant, the pear shaped diamond is a stylish choice among diamond shapes. Worn with the point toward the tip of the finger, its graceful, tapered shape can make the hand look slimmer and more elegant, perfect for an engagement ring. Pear shaped diamonds come in a variety of proportions, so there are many options for choosing one that flatters the finger. Look closely at the wings on either side of the point to make sure they are symmetrical, with the rounded end a good semi-circle. Since the point is the weakest feature, look for (and avoid) inclusions in that area. If prong setting the diamond, use a V-shaped prong on the point for greater protection. As with oval and marquise diamond shapes, the bow-tie pattern on the table should be minimal, or better yet, non-existent. 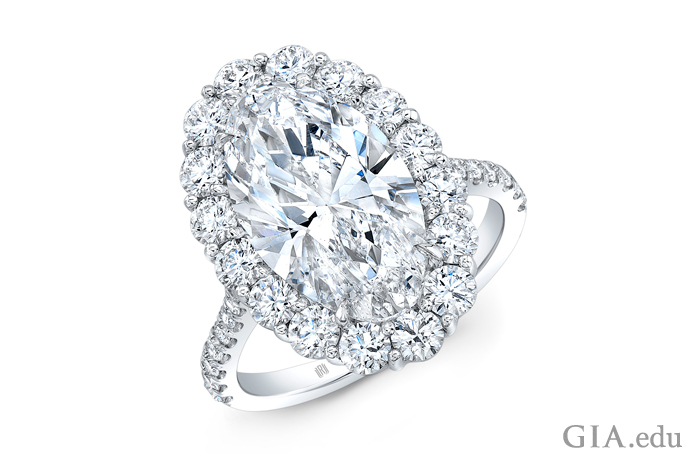 The heart shaped diamond is the essence of romance. It is also a very flattering style for larger fingers. There are good reasons why this is one of the rarest of diamond shapes for engagement rings. A well-shaped heart requires a large diamond, at least one-half carat. In addition, inclusions tend to be more prominent in this shape, so you want a diamond that has good clarity. Symmetry is also key: The well-rounded lobes should match in size and shape, as well as faceting style, and the cleft between them (as well as the point) should be well defined.